Indigo Bunting's pleasant appearance brought me to a large Tulip Poplar tree. In a short 15 minutes, I observed 25 species. 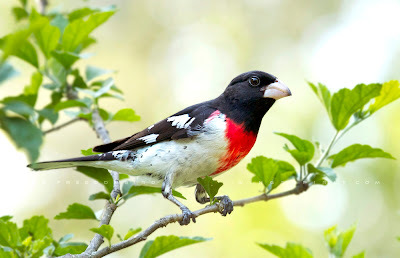 I managed to snap a beautiful male Rose-breasted Grosbeak (Pheucticcus ludovicianus). This grosbeak flew down from the top of a Tulip tree and landed on a hardy Hibiscus tree. They are migratory and based on what I documented from the past, they'll stay around for a week to 10 days and they are like cardinals, love sunflower seeds. 7 Cedar Waxwings : yeah, I still see lingering waxwings and they love tulip poplar's flowers. They stay for about 10 minutes today. 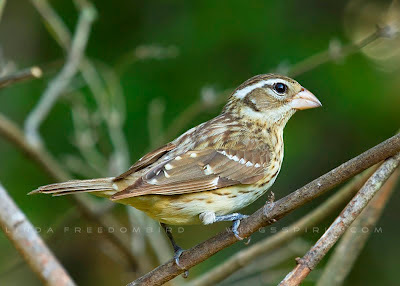 1 Rose-breasted Grosbeak : I saw three males on Friday...Grosbeaks are migratory and based on what I documented from the past, they'll stay around for a week to 10 days and continue their journey to the north. 1 male Brown-headed Cowbird : most birders don't like cowbirds. But I love them equally and this male chased away three other males. Update: I snapped this female the very next day (early Saturday morning) and I have not seen them after the weekend. I do love crows for their fearlessness and also for their entertaining antics, but they can really be bullies!